IT’S been a memorable couple of months for Triple Crown Syndications. 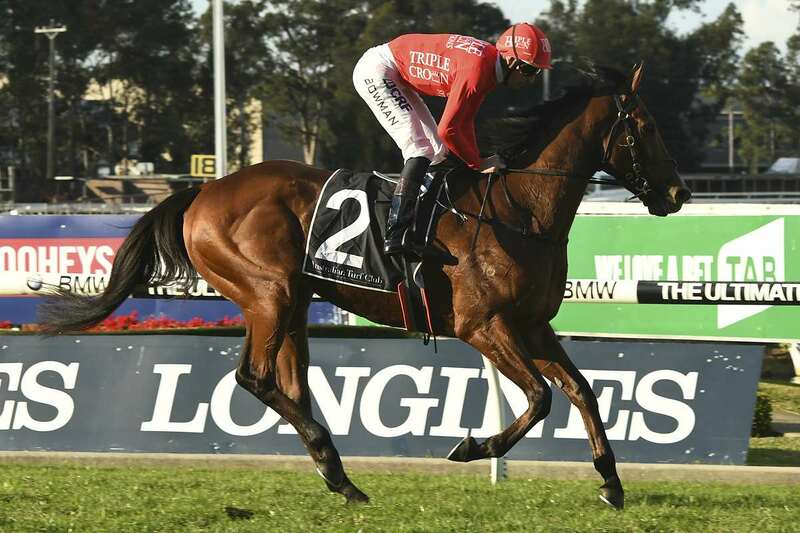 ‘Stable’ star, Redzel, won the Group 1 Doomben 10,000 in May, while Dothraki could consider himself a little unlucky in the Group 2 Moreton Cup when second to Deploy. Gold Symphony, meanwhile, should have finished a deal closer in the Group 1 Stradbroke last month after being caught wide throughout, so it probably didn’t come as a great surprise when sent out second favourite for Saturday’s Listed Civic Stakes over 1350m at Rosehill Gardens. “He (Gold Symphony) did it pretty comfortably in the end,” Triple Crown’s Chris Ward points out. “That was a good run in the Stradbroke and back against this class he was always going to be a solid chance. Triple Crown purchased Gold Symphony, a 4YO son of Reward For Effort, at the 2014 Inglis Melbourne Premier Yearling Sale, paying $100,000 for the privilege. Universally regarded as meticulous in their approach to yearling selection, Ward and his brother, Michael, liked the then colt from the moment they laid eyes on him. “He’s from the first crop of Reward For Efforts and we hadn’t purchased one at that stage,” Ward explains. “There were two reasons why he stood out for us … 1. he’s just a beautiful, physical type and 2. he’s such an incredible mover. Originally trained by Peter Moody where he won the Vain Stakes and McNeil Stakes (both Group races) at successive outings, Gold Symphony was switched to the Snowden stable in February of last year, from which he has won a Listed National Sprint in Canberra and, now, the Civic. All up, Gold Symphony has won six from 20, with four placings and $515,750 in stakes. Cheering on Gold Symphony’s Civic victory too was Chatswood Stud’s Greg Willis, who stands Reward For Effort, alongside Anacheeva, All American and newcomer, Ajaya. “We take a lot of pride in Gold Symphony as he was born and raised here at Chatswood,” Willis reveals. “He carries my dad, Alan’s, old AW brand and was bred by long-time client, Jack Keeley, who was one of the original owners of Reward For Effort. “Jack’s also got a handy full sister to Gold Symphony – Premium Reward – that has won a couple of races in Perth, while there’s an unraced 2YO colt, a full brother, with Bjorn Baker in Sydney that won a trial at the end of June. “Reward For Effort has quite a few coming through, which augurs well for the season ahead. His 4YO, Ability, is living right up to his name by winning his last two starts in Melbourne, while Brugal Reward won a Group race at Moonee Valley in February and should be back in the spring. “Actually, the other boys should have quite a bit of representation in the coming months too with Queensland Derby third, Ana Royale (by Anacheeva) aiming for a tilt at the Caulfield Cup, while Yankee Rose (by All American) is being primed for a big campaign. HOOFNOTE: Chris Ward adds that Doomben Cup winner, Redzel, will target spring plums like the Moir Stakes and Manikato Stakes, but is also hopeful of getting a run in the $10 million Everest in October.